It is expected that all students will be neat and tidy in appearance at all times and dressed in full school uniform as set out below. A reminder to have name labels on all items of clothing. Jewellery is limited to a watch; a gold or silver chain with a Christian symbol, worn under the shirt; one small pair of earrings worn in different earlobes only. NO multiple earrings, nose or tongue piercing are permitted. Students with inappropriate piercing will be sent home. NO bracelets, anklets, rings or chokers are permitted. Inappropriate jewellery will be confiscated and parents will need to collect it from the school. Are not acceptable and are to be covered at all times this includes Henna as well. The College backpack is the only bag to be used on a daily basis. The College excursion bag may be used on excursions or to carry any extra equipment. No other bag is to be bought to school. Graffiti on the bags will not be tolerated and must be removed. The bags are available at the Uniform Shop for purchase. Hair is to be tied back if shoulder length or longer. Only pink, light blue or maroon ribbons / headbands are to be worn. Hair should be of one natural colour. Dyed, coloured, bleached or streaked hair (including balayage/ombre and other styles) are all unacceptable and students will stay at home until hair is acceptable. Students with acrylic nails will be sent home immediately and will only return when they have been taken off. Nail polish is not permitted. Shoes are to be black, leather, low-heeled and lace-up. Coloured laces, metal or other adornments are NOT permitted. 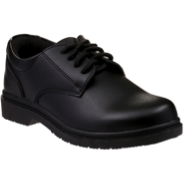 Black, leather, low heeled and lace up school shoes. Open top (Mary Jane style) shoes that present a WHS risk. Black leather converse casual sneaker/shoes that present a WHS risk. All students must own a blazer with the College emblem and wear it to and from school in Terms 2 & 3 and at formal College functions. The blazer is worn in Terms 1 & 4 if the weather is cool. College scarf may be worn with the blazer. College jumper is an optional garment that can only be worn under the College Blazer. The College jumper cannot be worn in the summer uniform Terms 1 & 4. The College blazer is always the outer garment to and from school. The skirt is to be covering the knees or below. The sports uniform is only to be worn on designated days. College sport socks are to be worn with the sports uniform. Students must wear protective closed-in athletic type shoes that protect the ankle and have a supportive sports sole. The purpose of the sport shoe is to provide support and promote safety during sporting activities, to enhance performance and to prevent the possibility of the development of overuse of long-term knee and ankle injuries. Any student wearing incorrect Sport shoes will receive an automatic LCS Detention. Please follow the instructions on the labels of the uniform. Uniforms damaged through washing will need to be replaced at the family’s own cost. Incorrect uniform: Any student who is out of uniform must bring a note from their parent or guardian explaining the infringement. Failure to provide an explanation for the infringement will result in a lunchtime detention.